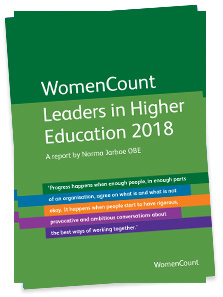 WomenCount: Australian Universities 2016 reports on the participation of women in the most senior leadership roles in the 40 universities that are members of Universities Australia. These roles include Governing body members, Chancellors, Deputy Chancellors, Chairs of key governing body committees, Vice Chancellors and their executive teams, Chairs of academic boards and heads of faculties or schools. Over half of all universities have gender-balanced boards of 40%-60% men or women. However, the Chancellors who chair the governing bodies are overwhelmingly male as are the Vice-Chancellors who lead the universities. Women are a majority of academic board Chairs but are only about a third of heads of faculties or schools in the top tier of the academic structure. The report, sponsored by Perrett Laver and launched by Universities Australia at its annual Higher Education Conference in March 2017, shows that universities, individually and collectively, have taken concerted action to increase women’s leadership in senior roles. There is progress to celebrate but work is continuing across a number of priorities.